Nintendo’s Family Computer, or Famicom, proceeded to dominate the console market after its 1983 launch. Sega had entered the market, releasing their own 8-bit console, the Master System, to directly compete with Nintendo, but they failed to even slow them down. This began to change in 1987 when NEC Corporation launched the PC Engine – later dubbed the TurboGrafx-16 internationally. The following year, Sega launched the Mega Drive, the 16-bit successor to their Master System. Though Nintendo’s executives were not in a hurry to design a new console, they reconsidered when they observed their market dominance beginning to slip. It was up to Masayuki Uemura, the designer of the Famicom, to come up with something even greater. Fortunately, his newest creation, the Super Famicom, was ready to go a mere three years after the launch of the PC Engine. It was an immediate success with Nintendo’s initial shipment of 300,000 units selling out in a matter of hours. In fact, it caused such a social disturbance around shopping centers that the Japanese government stepped in, asking developers to only launch consoles on weekends to avoid any future chaos. A few sources even state that this hot commodity managed to capture the attention of the yakuza, leading Nintendo to ship the consoles at night to avoid any potential interceptions. Naturally, consoles are nothing without their games, and after the success of Super Mario Bros. 3, Takashi Tezuka and Shigeru Miyamoto were determined to have the console make a good first impression on launch day. Joined by graphics designer Shigefumi Hino, they began work on a new Mario installment. The team consisted of ten people, most of whom had experience working on Super Mario Bros. Though Mr. Tezuka was the director once again, the core team said that Mr. Miyamoto wielded the most authority during the development cycle. The staff members understandably had their reservations about the new hardware, anticipating they would have difficulties working with it. Mr. Tezuka stated that the software tools had not been fully developed. In other words, much like with Super Mario Bros., they found themselves for want of a style guide. As an experiment, they ported Super Mario Bros. 3 to the Super Famicom. They decided it felt like the same game in spite of its improved colors and sprites. Mr. Miyamoto realized then that their new goal was to use this improved hardware to create something entirely new. The game saw the light of day alongside the Super Famicom itself in November of 1990 under the name Super Mario World: Super Mario Bros. 4. The Super Famicom was slated for a North American release the following year. 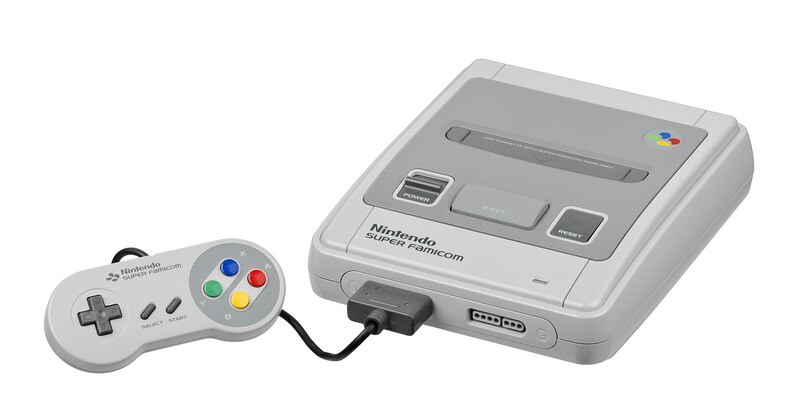 Keeping consistent with its predecessor’s name, it would become the Super Nintendo Entertainment System (Super NES or SNES) overseas. Super Mario World, dropping the Super Mario Bros. 4 subtitle, was to be one of the console’s launch titles abroad as well. Though both Super Mario World and the platform on which it was released proved to be a success, Nintendo found themselves facing a particularly fierce competitor. Sega brought the Mega Drive to North America where it was known as the Genesis. One of their games, Sonic the Hedgehog, ended up being their console’s biggest hit. The hip, cool title character was popular with children and teens, playing up to the era’s zeitgeist. Sega of America didn’t stop at extensively marketing Sonic the Hedgehog. They claimed theirs was the superior console due to it having what they referred to as “blast processing”, and even went as far as outright insulting Nintendo and, by extension, Super Mario World. Thus began one of the fiercest and most famous video game rivalries of its day. As a result of the popularity of Sonic the Hedgehog, Super Mario World was dismissed in many circles as just another Mario game. Meanwhile, with its fast-paced gameplay, Sonic the Hedgehog was the title to own in 1991. However, as is the case in many stories like this, the all-seeing, all-knowing power of hindsight granted Super Mario World a new lease on life. Though Sonic the Hedgehog is still considered a classic, Super Mario World is the game people would be more likely to find on a given list detailing the greatest of all time. On top of that, Mr. Miyamoto himself considered Super Mario World his personal favorite Mario game. Having a chance to fully establish its legacy, did Super Mario World manage to ultimately triumph over its flashier competition? Mario and Luigi have saved the Mushroom Kingdom from Bowser and his Koopalings, returning the stolen magic wands to their rightful owners. Drained from their perilous journey, they along with Princess Peach, decide to take a well-needed vacation. Their destination is Dinosaur Land, a world seemingly frozen in time from prehistoric epochs. As Peach is resting on the beach, she vanishes. Even after hours of searching, they are unable to find her. They eventually happen upon a giant egg in a forest. To their surprise, it hatches minutes later, revealing a young dinosaur named Yoshi. He tells them that his friends have also been imprisoned in eggs by the Koopas. Mario and Luigi realize King Bowser and the Koopalings must be responsible behind these strange occurrences. The three of them set out into Dinosaur Land on a mission to defeat the seven Koopalings and rescue Peach from Bowser. One of the biggest improvements Super Mario World has over Super Mario Bros. 3 reveals itself the exact second the player presses the “START” button in the title screen for the first time. 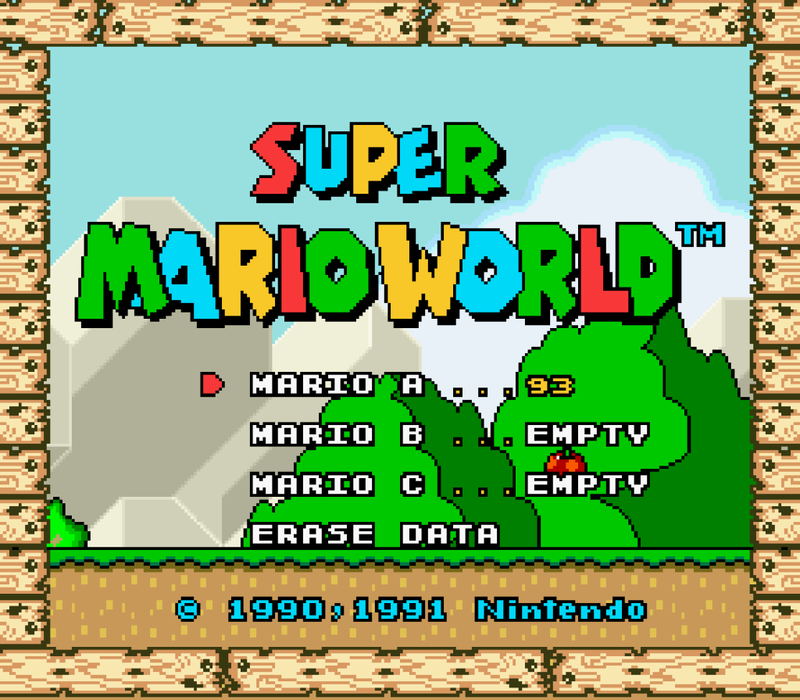 Super Mario World features save files. Super Mario Bros. 3 was quite an ambitious game for its time, making it quite strange that one had to clear it in a single sitting. There are no such problems in Super Mario World; much like in The Legend of Zelda, you can make progress in increments across multiple sessions. Upon starting a new game, you are taken to the world map. Mario starts the game at Yoshi’s House and the two yellow dots on the map represent stages. Unlike Super Mario Bros. 3, any given location on a map is a point of interest. 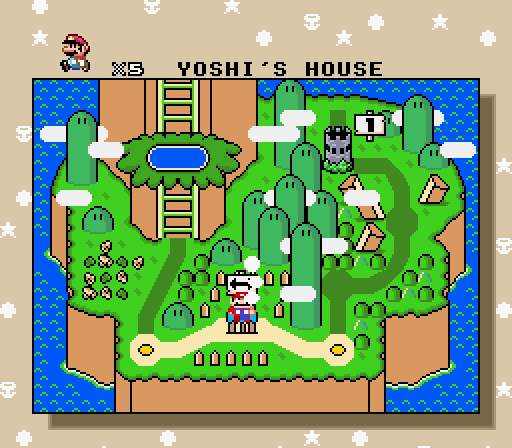 Furthermore, while a given world map of Super Mario Bros. 3 offered some degree of exploration to the player, Super Mario World gives the player a choice between two different stages from the onset: Yoshi’s Island 1 and Yoshi’s Island 2. After choosing the desired stage, players are taken to the game proper. 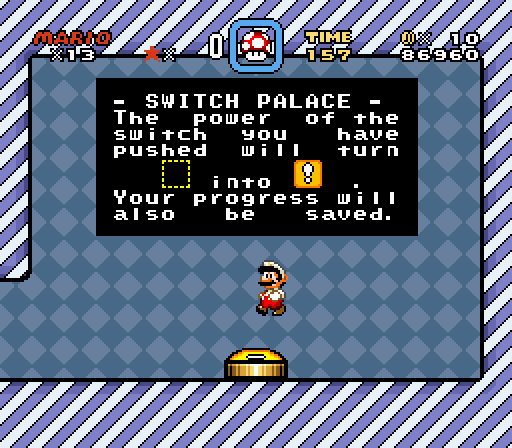 Within seconds of entering it, Super Mario World demonstrates the superior capabilities of the SNES. Backgrounds are now richly detailed as opposed to a single, uniform color, sprites boast a more fluid animation, and the sound effects have been greatly diversified. Though Super Mario Bros. 3 did a remarkable job lending a lot of personality to a game with the bare minimum of resources and context, Super Mario World demonstrated that Nintendo was about to up the ante. Although the graphical update is impressive, the efforts put into the visuals would be for naught without an actual game to parse. One of the first things players had to get used to when playing the SNES was its new controller. The NES’s controller had a directional pad and four buttons – two in the center labeled “SELECT” and “START” and two to the right labeled “B” and “A”. The TurboGrafx-16 featured one similar to that of the NES while the Sega Mega Drive or Genesis had three buttons on the face of its controller labelled “A”, “B”, and “C” in addition to the standard “START” button and control pad. The controller of the SNES was quite a bit different from that of its predecessor or rivals. Aside from the two center ones, the face of the controller featured four distinct buttons labelled “X”, “Y”, “B”, and “A” in a formation not unlike the directional pad on the opposite side. 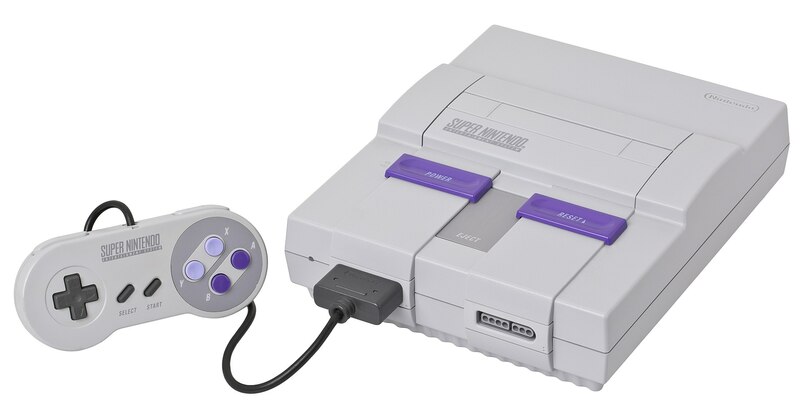 What allowed the SNES controller to stand out in 1990 was that it featured two new buttons located on the sides of the controller. These are commonly referred to as shoulder buttons, and they are labeled according to their locations on the controller in English terms: “L” and “R”. Just like its predecessors, Super Mario World is a 2D side-scrolling game. As such, the gameplay is quite similar. By holding down the “X” or “Y” button while Mario is moving, he will begin to run when in motion. The power meter from Super Mario Bros. 3 has been removed. Instead, you will know Mario is running at top speed when he begins spreading his arms out. Pressing the “B” button causes him to jump. As before, successful jumps depend on a number of factors, which includes trajectory, momentum, and the placement of obstacles. Like in the Mushroom Kingdom before it, blocks with a question mark printed upon them are littered throughout Dinosaur Land. 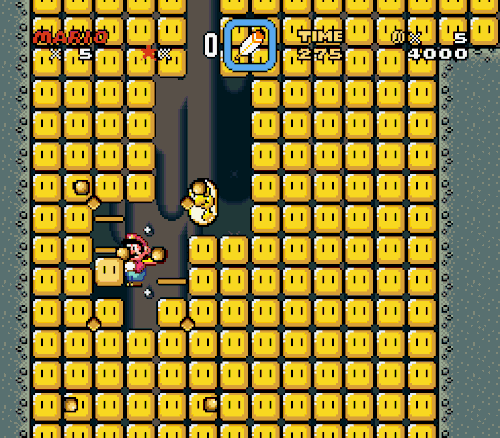 By striking these blocks from below with his fist, Mario can discover their contents. A majority of these blocks contain coins. If he collects one-hundred of them, he gains an extra life. If he’s lucky, he may find a Super Mushroom in one of these blocks. This transforms Mario into Super Mario, doubling his size and allowing him to take one hit from an enemy without dying. By finding a question mark block that normally would have contained a mushroom, Mario may uncover a Fire Flower instead. This transforms him into Fire Mario, allowing him to shoot fireballs with a press of the “Y” button. These projectiles bounce along the ground until they hit an enemy or leave the screen. If they hit an enemy, they are transformed into a coin. While the core gameplay is largely the same as it was in Super Mario Bros. 3, Mr. Tezuka and his team successfully took advantage of the new controller to introduce many highly appreciated enhancements. Though Super Mario Bros. 3 was a great game, one did run into the occasional problem of not being able to see too far ahead of Mario. This is not an issue in Super Mario World; by holding down the desired shoulder button, the camera scrolls until Mario is on the left or right edge of the screen. This is quite a contrast from the original Super Mario Bros. in which Mario couldn’t normally advance past the center of the screen. It’s as though this subtle change signposted to those paying close attention that Super Mario World was about to offer an ever greater experience. Though pressing “B” causes Mario to leap into the air, there are actually two different jump buttons. By pressing the “A” button, Mario performs a spin jump. Mario jumps and spins around in the air, ignoring the momentum he may have built up beforehand. Though the move is largely ineffective in his normal form, if he strikes an enemy from above using a spin jump, he can often defeat them outright. When in his super form, Mario can use this ability to smash blocks from above. On top of that, if he uses it on certain enemies or hazards, he will instead bounce on top of them. This process repeats itself until he lands on a solid surface. One vast improvement over the original presents itself roughly halfway through the stage. There, the player will come across a small goalpost. By running through its tape, Mario’s progress in that stage will be temporarily saved. Should he die at any point, the player will start from this checkpoint. In a measure of generosity, if Mario cuts the tape in his standard form, he will transform into Super Mario automatically. The end of a stage is signified by a larger goalpost with a bar that constantly moves up and down. Mario is awarded a number of stars based on its altitude when he touched it. The higher the bar is when Mario passes through, the more stars he obtains. The maximum amount he can obtain at once is forty. It’s not necessary to touch the bar to clear the stage, but failing to do so will result in Mario getting zero stars. 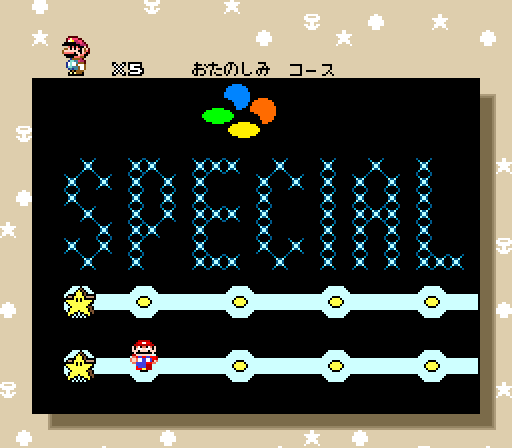 When Mario obtains at least one-hundred stars, the player is taken to a bonus minigame. In this room, there are nine blocks. Eight of them alternate between three different images: a mushroom, a flower, and a star. The central block’s image is randomly fixed to one symbol the second the player begins the game. The goal of this game is to match three images. In a manner similar to tic-tac-toe, these images can be matched horizontally, vertically, or diagonally. 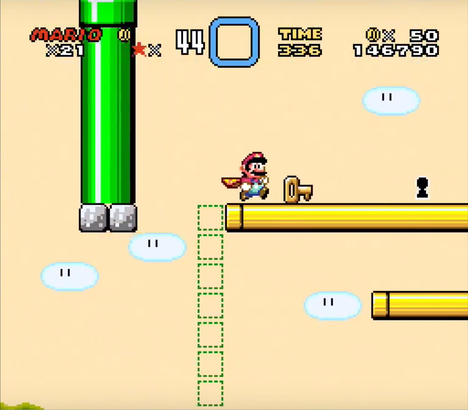 For every match, a single 1-up Mushroom is dispensed from the pipe on the left side of the screen. Naturally, the maximum number of extra lives you can obtain at once is eight. 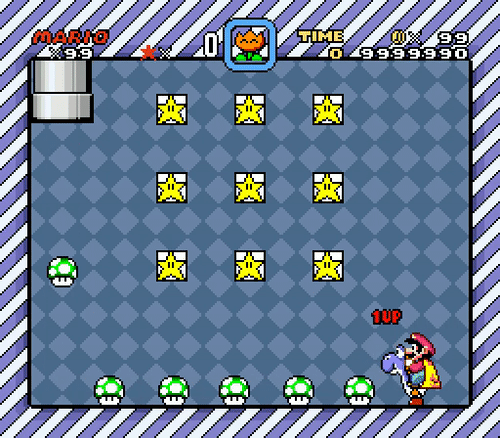 Unlike in Super Mario Bros. 3, the matching symbol is of little relevance; nine mushrooms will yield the same result as nine stars. Although progress is measured by clearing stages much like in its predecessor, there is a subtle distinction between how the two games go about doing so. In Super Mario Bros. 3, the stages themselves blocked Mario’s progress. 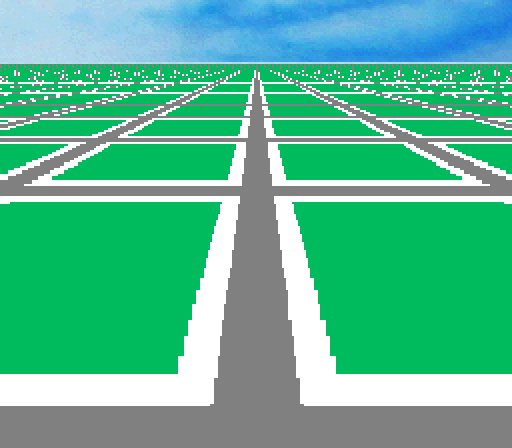 Once completed, the player could not reenter them for any reason unless they lost all of their lives. By contrast, Super Mario World only forbids players from travelling a blank path; clearing a stage is what happens to fill it in. On top of that, the player is allowed to enter a stage they have already cleared. When reentering a stage, the player can press the “SELECT” button while the game is paused to return to the world map. There is a point to revisiting a stage, but it won’t become obvious until Mario reaches the second region. One of the most notable mechanics Super Mario Bros. 3 brought to the table was its inventory system. With the ability to visit any cleared stage at one’s leisure, Super Mario World greatly simplifies inventory management. By collecting a second power-up, the old one is placed in a box on the top of the screen. This power-up can be dispensed from the box at any time by pressing the “SELECT” button in normal gameplay. Alternatively, if Mario survives taking damage, the power-up will drop down automatically. 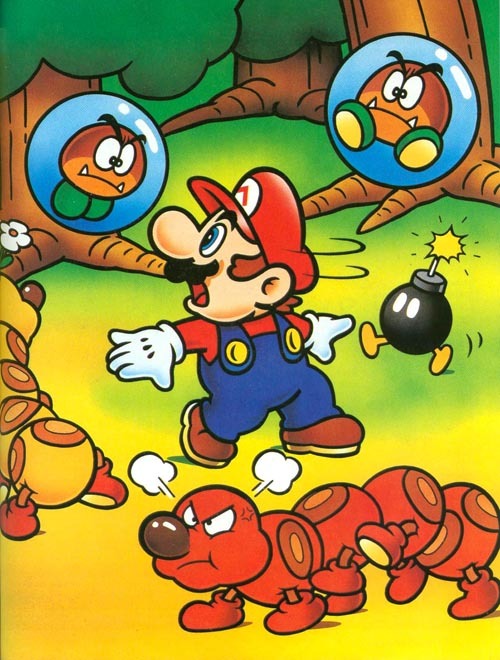 This is especially helpful because Mario reverts to his normal form if struck by an enemy as Fire Mario – he doesn’t revert to Super Mario first. If the player opts to clear Yoshi’s Island 1 first, Mario will be taken to the summit of Kappa Mountain. Here, there exists a stage dubbed the Yellow Switch Palace. This stage is quite simplistic with the first room containing a P-Switch. These switches have similar effects as their counterparts in Super Mario Bros. 3, turning blocks into coins and coins into blocks. However, the first one you encounter actually causes multiple coins to appear out of nowhere instead. You can use this opportunity to gather as many as you can. The second room houses the titular yellow switch. Pressing it both clears the stage and allows the player to save the game for potentially the first time. Furthermore, any yellow outlines the player may have encountered will now be yellow blocks with exclamation marks printed on them. Regardless of the form Mario is, a Super Mushroom will be released when he strikes the block from below. Though this is often helpful in a pinch, the blocks’ primary purpose is to create new solid ground. You may run into a situation in which they significantly help negotiating precarious jumps. Their utility can even be as simple as providing the player with a convenient safety net above select bottomless pits. There are three other switch palaces, and finding them all can make the game significantly easier. 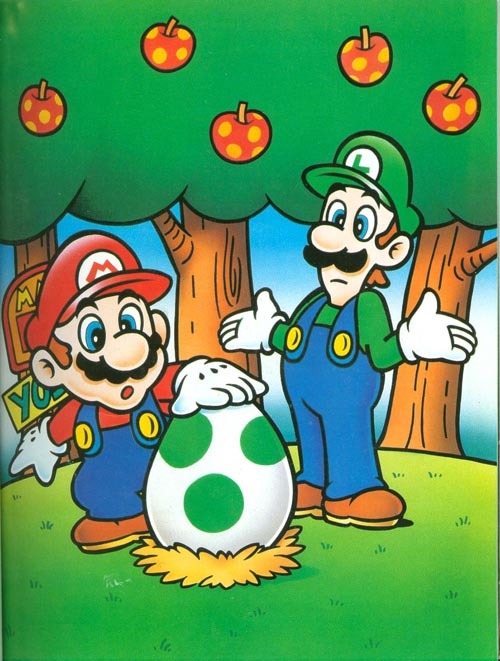 By striking certain question mark blocks, Mario may uncover an egg containing Yoshi. This dinosaur is happy to help Mario on his quest to save Peach. Ever since Super Mario Bros., Mr. Miyamoto envisioned Mario having a dinosaur companion. 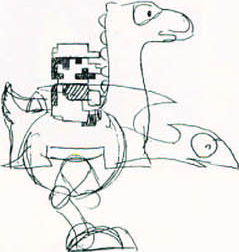 As he worked on Super Mario Bros. 3, Mr. Miyamoto often had numerous sketches around his desk, one of which depicted Mario riding a horse. Because of this, Mr. Tezuka believed Yoshi’s creation was largely the result of Mr. Miyamoto’s fondness for horse riding and country and Western themes. Then again, the inspiration for this character can be traced back further to the 1984 game Devil World. This game starred a green dragon named Tamagon in the lead role. He decided one day to attack the Devil’s World, drawing his power from the crosses and bibles he finds. Due to Nintendo of America’s strict policies regarding religious icons, Devil World was not released in North America. However, the strict technical limitations of the NES prevented engineers from adding such a character. With the superior capabilities of the SNES, they realized they had no such problems. As a result of Mr. Miyamoto’s idea, they took this opportunity to set the game in a dinosaur land. Once they had their setting and the means with which to implement his idea, all they needed was a character model. Mr. Tezuka asked Shigefumi Hino to draw a reptilian creature based on Mr. Miyamoto’s sketches. Mr. Tezuka thought the first few sketches were too reptilian, believing the style didn’t really belong in the Mario world. 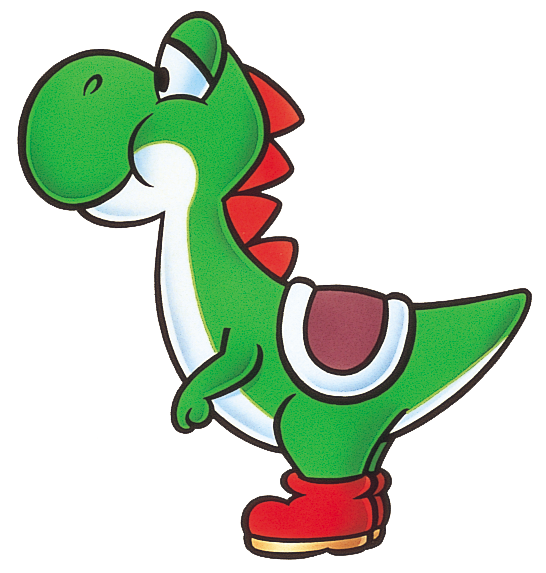 From here, he encouraged Mr. Hino to create a cuter character, hence Yoshi. Mario can ride on Yoshi’s back. Yoshi controls similarly to Mario himself, being able to run and perform basic jumps. While he can jump on certain enemies, thereby defeating them outright, his primary means of defense is to eat them. He does this by extending his long tongue and swallowing them whole. This maneuver is performed with a press of the “X” or “Y” button. Though this doesn’t work on all enemies, he is perfectly capable of eating ones larger than himself. Things get interesting if Yoshi ever attempts to eat a Koopa Troopa in its shell. If the shell is green, he can simply spit it back out just like how Mario throws them. Attempting to ingest a red shell causes him to spit out three fireballs. If Yoshi has a blue shell in his mouth, he will sprout a pair of wings, allowing him to fly in the air. Finally, if he eats a yellow shell, he can shake the earth upon making contact with the ground, damaging nearby enemies. If Mario is struck while riding Yoshi, the dinosaur will run away in a panic. Mario himself doesn’t take damage from this situation, though he is still granted the default invulnerability frames and he can retrieve Yoshi by hopping into his back. Mario’s goal in a given region is to reach its castle and defeat the Koopaling residing there. This is the edifice indicated by the numbered sign, the first of which belongs to Iggy Koopa. Castle stages differ from standard ones in various ways. To begin with, Yoshi cannot enter these indoor areas; he will wait outside for Mario. Within the confines of the game universe, it is Yoshi’s lack of bravery that prevents him from venturing inside. From a technical standpoint, these castles often feature doorways, which cannot be entered if Mario is riding Yoshi. 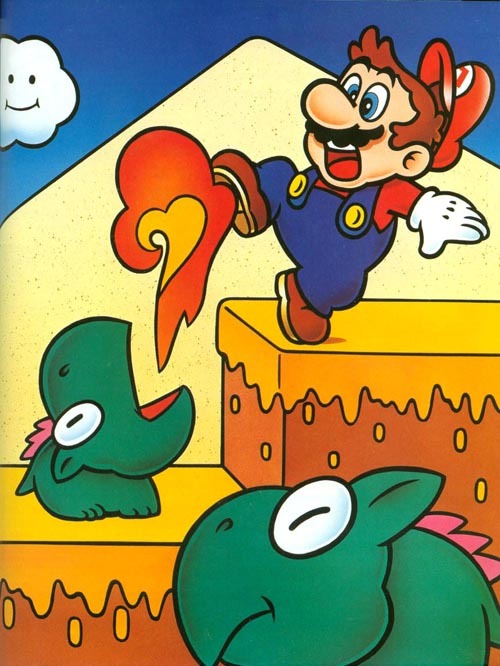 While Mario may encounter various hazards as he journeys through Dinosaur Land, they are downright benign compared to what awaits him in castles. The Koopalings’ castles often feature traps such as autonomous saw blades, lava pits, and the standard-issue arbitrarily placed spikes. I personally felt the most shocking moment occurred in the first castle wherein Mario is placed in a corridor that scrolls automatically. All seems well until a few seconds later when a giant column comes slamming down in an attempt to crush Mario. 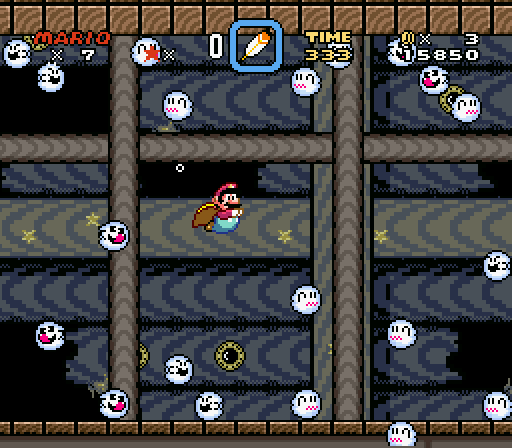 Though Super Mario World is in no way a survival horror game, it could very well have introduced many unsuspecting players to the concept of a jump scare. I especially enjoy how this obstacle is placed in the first castle – it demonstrates that the game doesn’t just utilize the advanced capabilities of the SNES for aesthetical purposes and. The entrance to the boss’s lair marked with a giant, red door. The boss fight against Iggy shows that Mario must use different tactics when fighting the Koopalings this time around. Iggy himself is impervious to Mario’s standard attacks. The only way to defeat him is to knock him into the lava. This requires you to take the platform’s buoyancy into consideration. Only carefully timed attacks when you have the higher ground will have any kind of success. 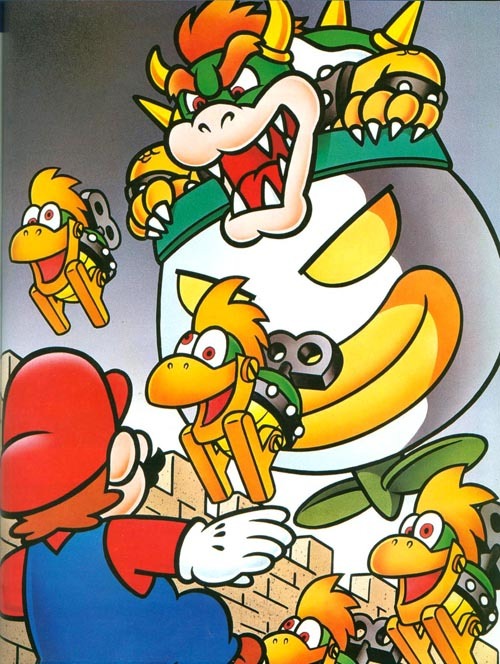 Felling Iggy will allow Mario to free one of Yoshi’s friends and destroy the Koopaling’s castle. From here, they’re taken to the next region: the Donut Plains. Anyone who cleared the Yellow Switch Palace will be familiar with this screen; it is the world map of Dinosaur Land as a whole. This transition serves many purposes. To begin with, it’s a silent way of telling the player that Yoshi’s Island was a mere prologue and the real game begins here. The player is even allowed to look over the entire map thereby getting a glimpse of what awaits them in the future. To commemorate your passage into the heart of the game, the Cape Feather makes its first appearance. In Super Mario Bros. 3, the Raccoon Leaf was introduced as an alternate power-up to the Fire Flower. 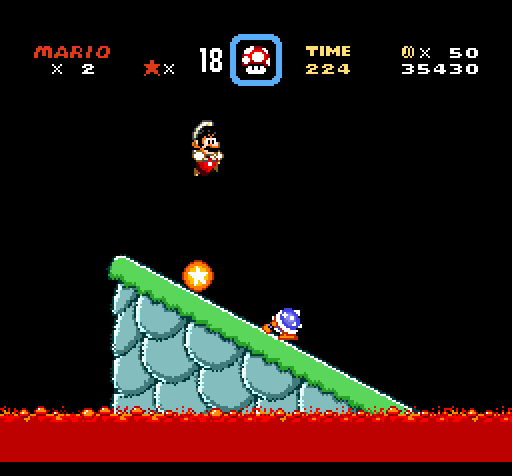 While the Fire Flower increased Mario’s offensive capabilities, the Raccoon Leaf’s purpose was to enhance his mobility. Though the Raccoon Leaf was originally slated to make a return in Super Mario World, the replacement Cape Feather keeps in line with this theme. True to its name, collecting it causes Mario to don a cape. Like the Raccoon Leaf, Mario can use the cape to execute a spin attack, knocking over vulnerable enemies. It also allows him to fly after getting a running start, though the mechanics are significantly different. While Raccoon Mario could soar freely for a limited amount of time, Cape Mario can fly indefinitely, but he is locked to moving in his initial direction. 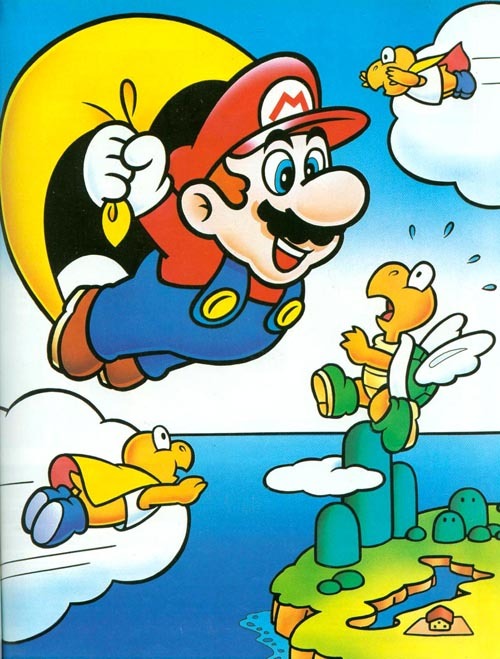 By pressing the opposite direction in which Mario is flying on the directional pad, he will begin to gain altitude. If you press it in the same direction, he will go into a nose dive, potentially hitting the ground with a mighty crash. Fortunately, hitting a hazard while airborne doesn’t damage Mario; it merely causes him to fall to the ground. His descent can be slowed down by holding down the “B” button. Mario is still capable of flying when riding Yoshi, but his mobility is drastically limited, being unable to glide forward after his initial ascent. The Donut Plains also serves as an introduction to the eerie Ghost House stages. Much like the castle stages, Yoshi cannot enter these Ghost Houses. True to their name, the Ghost Houses are haunted by Boos, the timid specters introduced in Super Mario Bros. 3. These haunted houses are more mazelike than the castles, requiring the player to keep their eyes peeled for anything out of the ordinary. This often requires a hefty use of P-Switches, many of which cause doorways to spontaneously manifest. Ghost Houses are also notable for allowing players to save their game upon completing them. Castle stages serve the same purpose, but in the Japanese version, they couldn’t be reentered. In international versions, one could with a press of the shoulder buttons, but because Ghost Houses tend to be easier once one discovers how to navigate them, they are the ideal method of saving one’s progress. Finally, and most importantly, the game’s second region justifies the player’s newfound ability to reenter stages in Super Mario World. A sharp-eyed person will notice that Donut Plains 1 is marked with a red dot rather than a yellow one. This is a clue that the stage is a little different from the preceding six. Stages marked with a red dot have a second exit in addition to the standard one. While the regular exit always appears in the form of a goalpost in outdoor stages, this doesn’t always apply to the secret one. In fact, the first one sets the standard for what to expect in the future. If Mario searches the area thoroughly, he will find a key. Though there are no locked doors into which he can insert this key, there is the next best thing: a keyhole inexplicably floating in midair. By bringing the key to this mysterious keyhole, it will open up a secret passageway, ending the level and opening up a secondary path on the world map. In fact, anyone who quit the game only to return to it later may have noticed a number next to their save file. This represents the number of exits the player has found. There are a total of ninety-six exits in Dinosaur Land, all of which will open up a different path upon discovery. Super Mario Bros. and both of its immediate follow-ups featured a linear level progression. It could be defied if the player found a Warp Zone, but the game wouldn’t have felt out of place in the arcades. Super Mario Bros. 3 granted players a degree of freedom within the worlds themselves, occasionally allowing them to choose between two or more stages. Finally, Super Mario World marks the final step of the series’ evolutionary direction by taking place in a single, homogenous land that gradually opens up depending on what routes the player takes. Dinosaur Land is divided up into multiple regions, yet no matter how far one progresses, it’s always possible to walk back to the beginning of the game. Because of this, I feel Super Mario World could be construed as what would happen if the staff transplanted the Metroid ethos into Super Mario Bros. The biggest difference is that the exploration occurs across a level selection screen as opposed to within one single, gigantic area. Otherwise, it does manage to hit many of the same notes as Metroid and the subgenre it would inspire – albeit in a highly unorthodox fashion. The secret exits await anyone tenacious enough to find them, and the perceptive are rewarded with extra content. Indeed, when one examines the sheer number of secret stages present in Super Mario World, it seems to form an entire second game. This premise becomes especially apparent over the course of the next two regions. The one that follows the Donut Plains, the Vanilla Dome, contains the Red Switch Palace – the third of its kind. The path to it is found through a careful search of the region’s second stage. After activating the switch and returning to Vanilla Dome 1, the player can easily find the secret exit using the now filled-in red blocks. If they choose to do so, they will uncover the region’s first secret stage. By following the path this stage uncovers, Mario will find himself in Vanilla Heights, the natural roof of the Vanilla Dome. 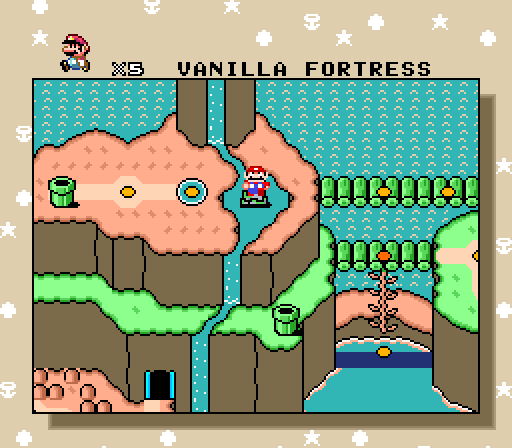 After firmly establishing both the existence and importance of secret exits, the Vanilla Dome is an entire region that takes the basic idea to its logical conclusion. That is, the region has two potential final stages: Lemmy’s Castle and the Vanilla Fortress. A player returning from Super Mario Bros. 3 may take one look at the various fortresses scattered throughout Dinosaur Land and hypothesize that they are easier to traverse than the Koopalings’ castles. Though this would be a fair assumption that is consistent with the conventions of Super Mario Bros. 3 wherein airship stages were usually significantly harder to get through than the mini-fortresses, it is practicably incorrect. In fact, with one exception, these fortresses are often considered among the most difficult stages in the game. The Vanilla Fortress itself is submerged in a large body of water. 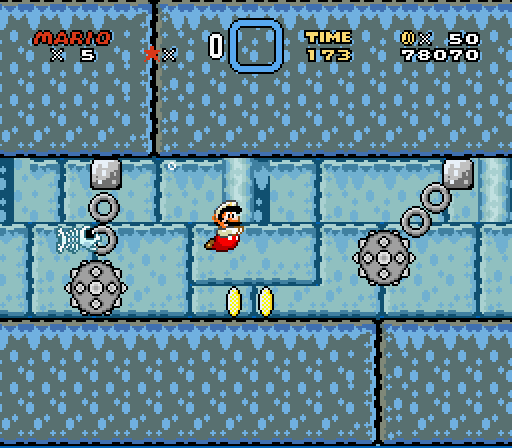 This means Mario must dodge the various traps typically found in a castle stage while fighting against the limited mobility the water saddles him with. In a way, this provides a secondary interpretation of World 9 from The Lost Levels. By placing an otherwise standard stage underwater, it forces players to apply familiar skills in a vastly different way. At the end of the stage is a group of four Triceratops-like creatures cursed by Bowser to guard the various fortresses. In the original Japanese version, they are known as the Bui Bui, an onomatopoeia associated with the peace sign. As this cultural nuance would be lost abroad, those in charge of localizing Super Mario World opted to take a page out of Dayvv Brooks’s book by making a musical allusion. Therefore, what the Japanese know as the Bui Bui, the Western enthusiasts call the Reznor. This is a reference to Trent Reznor, the founder and sole consistent member of the industrial metal band Nine Inch Nails. Defeating them is a race against the clock, involving striking the platform they stand on from below before the bridge over the pit of lava collapses. What I like about the Vanilla Dome is that it substantially affects how Mario travels through the next region. Said region features two bridges precariously hanging over a massive expanse. On the surface, it would appear to be a disappointment, only featuring two stages before arriving at Ludwig’s Castle. 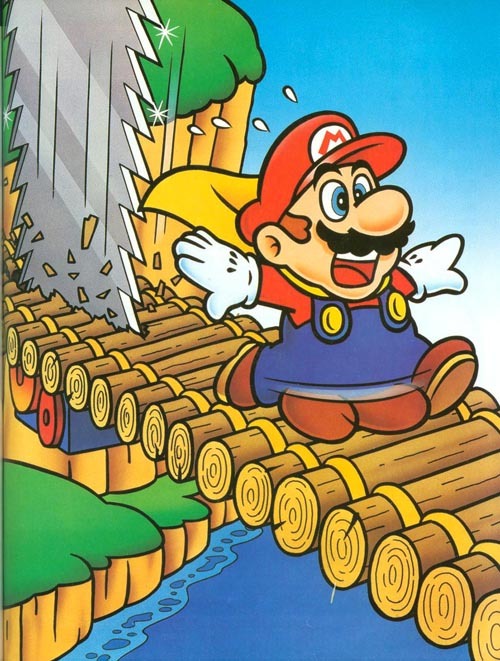 However, Mario’s method of ingress dictates which bridge he must take to reach his destination. If he defeated Lemmy, Mario will find himself traversing the Cheese Bridge before arriving at Cookie Mountain. On the other hand, if he infiltrated the Vanilla Fortress, he will cross the longer Butter Bridge instead. By the time the player defeats Ludwig von Koopa, they will likely know of secret exits and how they function. If not, the Forest of Illusion that follows the Twin Bridges will be a serious wake-up call. Anyone attempting to clear the stages normally will find themselves, quite literally, running around in circles. Only by finding the secret exit in Forest of Illusion 3 will Mario discover the path to Roy’s castle. 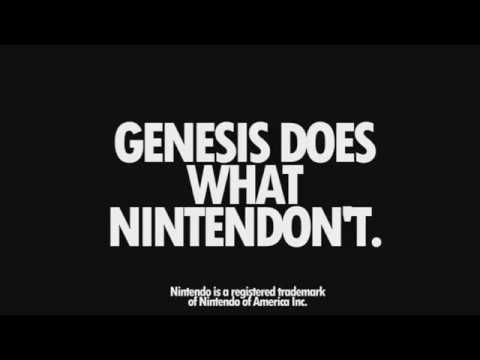 Future games would take cues from Super Mario World by rewarding perceptive players with extra content, yet this facet was rarely copied. This is what allows Super Mario World to shine in the face of its contemporaries. It introduces a mechanic fairly early on that a savvy enthusiast might dismiss as a trivial bonus before they eventually learn it’s not completely optional. The sixth visible region, the volcanic Chocolate Island, acts as something of a preliminary final exam. Its layout is somewhat reminiscent of the Donut Plains, yet it also serves as both an interesting contrast and parallel to the region that directly precedes it. The Forest of Illusion had an otherworldly quality to it, as trees vanished without a trace to reveal new paths, eventually looping around in circles if the player didn’t actively seek a way out. Meanwhile, the mountainous terrain of Chocolate Island makes it just as difficult to navigate, simulating the effect of the Forest of Illusion via mundane methods. As a result, you will need to discover another secret exit to proceed. In fact, Chocolate Island features what could be considered the game’s only mandatory fortress stage. To somebody only vaguely aware of the existence of secret exits, this would be their first experience with such a stage. After defeating Wendy O. Koopa, there would appear to be no more regions left to explore. All that remains is a sunken ship in the center of Dinosaur Land. However, this wrecked ship not only turns out to be haunted, it contains a device that causes a massive earthquake. Once the dust settles, the entrance to the final region, the Valley of Bowser, is revealed. Admittedly, one field in which Super Mario World falls short of Super Mario Bros. 3 concerns its final region. This is because, as a final world, the Valley of Bowser is something of a step down from Dark Land. Dark Land was one of the most intimidating environments of its day. You got a sense that the land itself was out to get Mario and Luigi as you guided them through it. 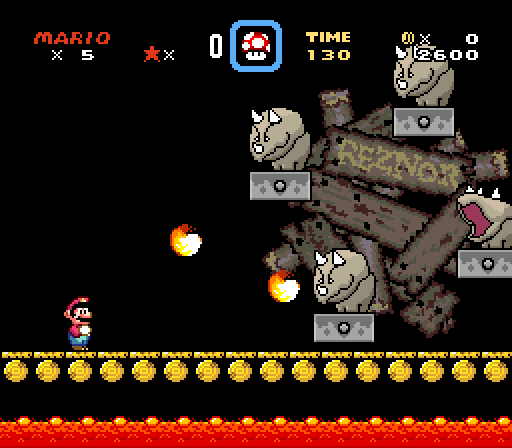 The oppressive atmosphere was aided by the fact that you constantly had to engage Bowser’s troops. 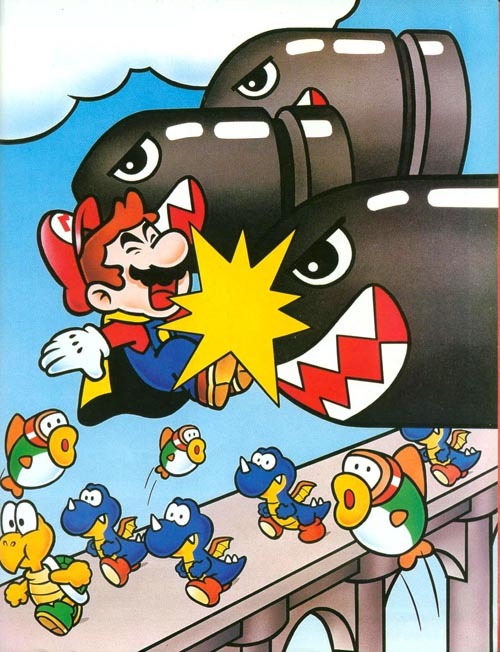 With stages pitting the Mario Brothers against the Koopa King’s tanks, battleships, and air fleet, players got the sense that they were fighting a full-scale military. This accentuated just how effective Mario and Luigi were as heroes. None of this was translated to the Valley of Bowser. Though the stages within are appropriately more challenging than in any preceding region, they boast fairly ordinary designs. One could have easily transplanted a given stage in the Valley of Bowser in an earlier region without anyone being the wiser. A savvy player may recognize the sudden difficulty spike, but it would be easy to dismiss as an anomalously tough early stage. Admittedly, this aspect is understandable. Part of what made Dark Land so intimidating was you were well and truly on a one-way path to the end of the game. With the complete lack of Toad Houses, you only had your reflexes and whatever resources you saved from previous worlds to get you through. With the regions of Super Mario World all connected, this aspect never had a chance to shine. Fortunately, this is rather minor slight in what is actually a fairly solid endgame. Though the Valley of Bowser lacks a punch, its namesake is about as far away from being a disappointment as possible. When you enter that final red door, you’re not thrown into the fight immediately. Instead Mario starts on an empty rooftop with the sound of thunder ringing through the black sky. A flying vehicle descends slowly. When it stops, Bowser himself emerges from the top. The fact that said vehicle has the face of a clown does nothing to negate the sheer impact of this dramatic entrance. It helps that the musical cues were executed perfectly, adding a crescendo at the exact moment he reveals himself. To further aid the impact, the interface disappears in this area – including the timer. Only the power-up box remains – assuming it contains one. This is case in which the developers were forced into brilliance as a result of technical limitations. Bowser’s clown car flies into the background and at the screen when he takes enough damage. 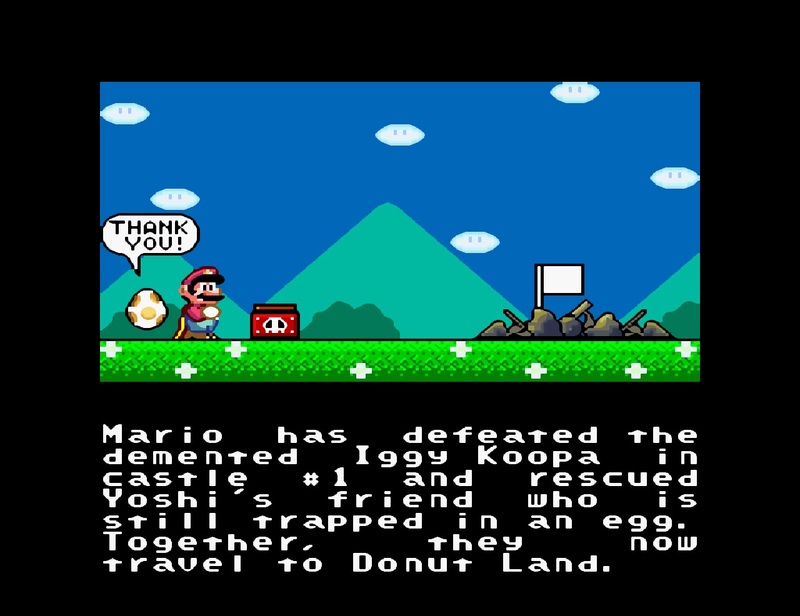 This is accomplished using what was perhaps the most touted feature of the SNES – Mode 7. Mode 7 is a graphics mode that allows background layers to be rotated and scaled on a scanline-by-scanline basis. By transforming background layers into a two-dimensional, horizontal plane, it creates the illusion of depth. In short, it was an attempt at simulating three-dimensional gameplay long before the technology could realistically allow it. This was evident in how depth could only be applied to backgrounds and not sprites. Even discounting its distinct technological advantage, I have to say the fight against Bowser is a marked improvement over that of Super Mario Bros. 3. 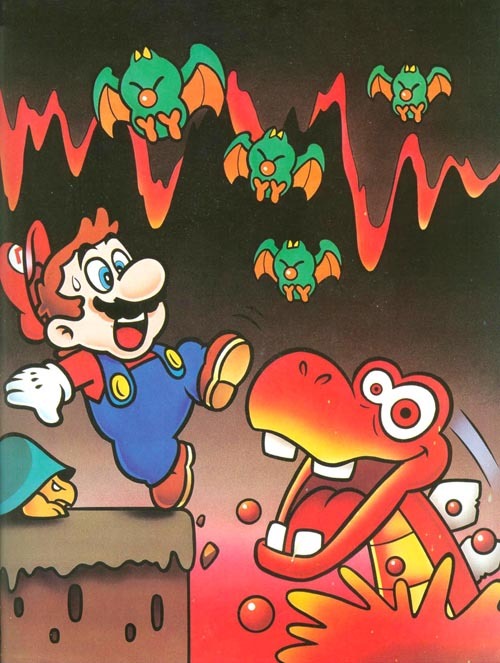 The final boss of Super Mario Bros. 3 was something of a letdown because while it did force players to think outside of the box, defeating Bowser involved passively waiting for him to fall out of the arena. Players could dispatch him with fireballs, but if they lacked a power-up capable of shooting projectiles, getting Bowser to fall out was their only strategy. In Super Mario World, defeating Bowser involves taking advantage of Mario’s newfound ability to launch projectiles vertically by throwing stunned Mechakoopas at him. Though it’s still ultimately a fight assisted by Bowser’s hubris, the player is now forced to play an active role in his defeat. Even with all of the great things I can say about Super Mario World, there is one facet that stands out as particularly admirable. Having established that discovering hidden paths is essential to winning the game, it seems highly fitting how an entire secret world can be found. By finding the hidden exit in certain stages, you can unlock the Star Road. This transports Mario to a land high above the Mushroom World: Star World. Star World has a strange gimmick compared to the standard regions. 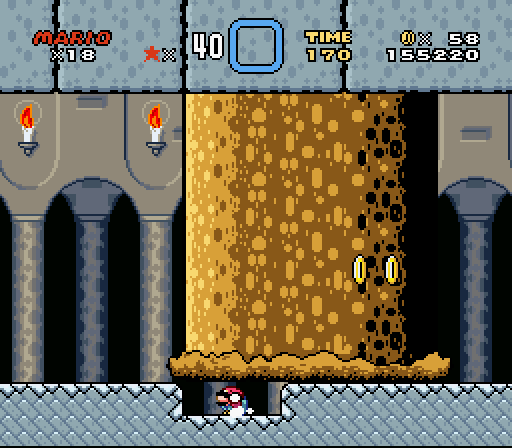 Four of the standard exits will simply lead Mario to the portal from whence he came. Only by finding the hidden exit can he make any significant progress within the world. The stages of Star World are designed to be difficult to navigate without having found any of the switch palaces, though it is possible to get around this limitation. It is also home to the red, blue, and yellow Yoshies. You can find their eggs at the beginning of these stages. However, they start off as hatchlings. What you must do is feed them enemies until they grow up. If you feed them a Super Star, they will transform automatically. These Yoshies differ from the standard green variety in what happens when they ingest a Koopa shell. For Yoshi himself, the color of the shell determines what power he gets. With these Yoshies, their own color determines what happens. 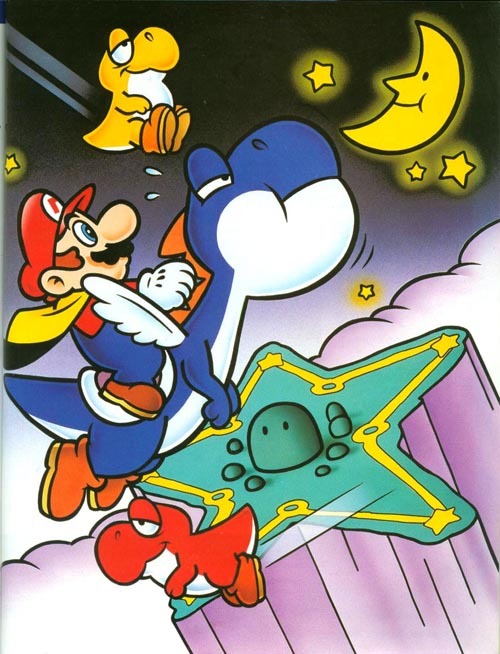 To wit, when the Blue Yoshi ingests any Koopa shell, he will sprout wings. By finding the secondary exit in Star World 5, you’ll learn the sheer lengths to which Mr. Tezuka and his team took their central concept. That’s right – the hidden world itself contains a hidden world. In 1990, most games required players to complete every single level in a linear order. The idea of a game having not one, but two hidden worlds awaiting persistent players was practically unheard of. The nomenclature of two of the stages within this zone in the original Japanese version even expresses astonishment that the player was able to find them. Simply dubbed the Special Zone, it could be seen as the polar opposite of Star World. 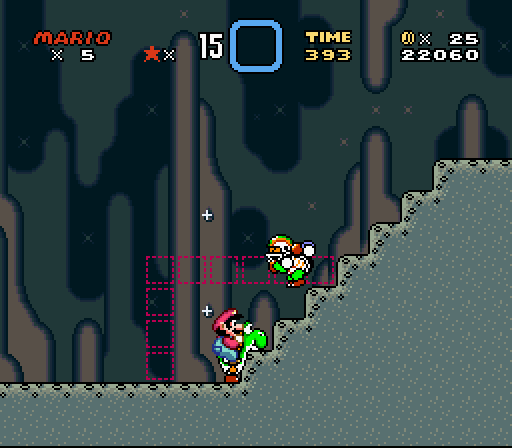 While Star World had five stages and necessitated the player to find the hidden exits to progress, the Special Zone features eight with nary a secondary path to be found. Theoretically, they’re all are a straight shot to the end. The reason I say “theoretically” is because getting to these stages’ goalposts is easier said than done. Anyone versed in the medium is familiar with the concept of the unusually brutal bonus stage. On the surface, it’s a decidedly strange idea – the developers are essentially rewarding a player’s hard work with even more hard work. Despite or probably because of this, many enthusiasts highly enjoy the unique challenges these bonus levels present. This remains true even when clearing these stages offers no practical benefit – just the ability to say they could is sufficient. If Super Mario World didn’t invent this trend with the Special Zone, it made absolutely sure that it would be codified. Many of the stages within the Special Zone could rival the most challenging ones from The Lost Levels in terms of sheer difficulty. Those with the tenacity to make it to the end will find themselves using a Power Balloon to dodge enemy projectiles, navigating a maze of platform rails, fighting the strong tide of a flooded meadow, and racing to the end of the stage before the short time limit expires. Owing to a combination of better controls and improved level design, I can say that while the Special Zone stages are on par with The Lost Levels, the challenge is genuine. The developers didn’t merely weigh them down with myriad annoyances and call it a day. The portal awaiting the player at the end of the Special Zone takes them back to Yoshi’s House, but with a twist. The world transitions from summer to autumn, lending the stages a Halloween motif. Koopa Troopas now wear Mario masks, Piranha Plants transform into Pumpkin Plants, and Bullet Bills morph into Pidget Bills. This doesn’t have any effect on the overall gameplay, but it’s a nice cosmetic reward for one’s hard work. It adds an extra layer of satisfaction when watching the credits roll. Shortly after Super Mario World received its deserved vindication, fans began arguing as to whether or not it could be considered the superior effort to Super Mario Bros. 3. Even to this day, it’s something of a point of contention with a clear resolution being unlikely. Though I feel it’s impossible to go wrong with either, I found myself stumped for an answer for the longest time. Part of the reason is because I didn’t feel one game had a significant advantage over the other. Though the stage design of Super Mario World is generally more elaborate, Super Mario Bros. 3 manages to achieve the same level of quality through sheer quantity. As I began giving it more thought, I now have a definite stance. The multiplayer campaign of Super Mario Bros. 3 remains to this day one of the best in the medium, providing a perfect, unique blend of cooperative and competitive gameplay. Super Mario World, on the other hand, goes back to a model not unlike Super Mario Bros. wherein players take turns completing stages. One doesn’t have to wait for their friend to lose before they can start playing, but it renders the multiplayer option a nominal feature. One could simulate the effects of this campaign at the marginal cost of sharing a life counter by passing the controller to their friend in a single-player session. That couldn’t be done in Super Mario Bros. 3; its multiplayer campaign needed players to retain control of their characters to function properly. Switching controllers in such a situation would be like changing characters in the middle of a board game. I can therefore conclude that Super Mario World is an unequivocal step down from Super Mario Bros. 3 in terms of multiplayer. However, I also believe that, certain exceptions notwithstanding, a game is only as good as its single-player campaign. This is because single-player makes up a game’s foundation more often than not. From there, multiplayer should be thought of as a bonus feature. It could be a bonus feature one spends more time with than the base game, but it’s a bonus feature nonetheless. Meanwhile, exploring Dinosaur Land at your leisure and opening up new paths are both concepts that are conducive to a great solo experience. It is for this reason I feel Super Mario World is better as a single-player game than Super Mario Bros. 3. Consequently, I can declare that Super Mario World is the superior experience – albeit by the slimmest of margins. Even after this explanation, I ultimately feel a newcomer shouldn’t contemplate which game to play for too long; one must approach the Mario series with the intent to play both. Super Mario Bros. 3 was a gigantic and borderline improbable step up from its predecessors while Super Mario World experiments with the series’ formula to an extent that it’s difficult to believe it saw its release a mere two years later. It was not easy for Mr. Miyamoto and Mr. Tezuka to follow up a game as universally beloved and commercially successful as Super Mario Bros. 3, yet they proved they were more than up for the task. In a good and appreciative way, it’s honestly a bit overwhelming to read your breakdown on the new features that had to be learned when this game came out. I’m sure that when I first played the Super Nintendo and picked this up, my much younger self was probably baffled by the new X and Y buttons and the inclusion of Yoshi, among all of the other aspects you mentioned. I don’t really think about it as much now but as you laid it all out, I started remembering that feeling of excitement and adaption that I was processing at that time. Super Mario World stands as my second favorite of the Mario series (right behind SMB2) and every time I go back to it, I’m shocked at how well it holds up- especially given that I was such a Sonic fan growing up so my memories are a bit more vivid about the early entries of that series. Given that 2/3 of your cons about the game are in relation to the previous one, though, I think you nailed everything exactly in this write-up. Super Mario World really only seems to have shortcomings when it is compared to its predecessor and even with that, it was just such an amazing opener for the Super Nintendo that those are fairly easy to look past. I don’t remember the new Super NES controller ever giving me trouble as a kid, but I can imagine it took quite a bit of getting used to given how comparatively simplistic any of the previous controllers were. The fact that there were two buttons on top of the controller was practically unheard of at the time. I would have to say that Super Mario World is my favorite 2D Mario game (this includes the New Super Mario Bros. series). Like A Link to the Past, later games emulating the feel of Super Mario World tried, but ultimately failed to grasp what made this one so good. Just the idea that secret stages could have hidden exits by itself distinguishes it from its successors. I have to admit I was also silently comparing the Valley of Bowser to World 8 from New Super Mario Bros Wii, the latter of which I feel is the second-best final world in the (side-scrolling) series behind Dark Land from Super Mario Bros. 3. The reason I didn’t say that is because I tend to write these reviews from the perspective of the main subject’s release date; it would make much more sense to draw such a comparison when I’m reviewing that game. The Valley of Bowser is well-designed, but it lacks that “final world” impact Dark Land had. Plus, even taking that and the superior multiplayer campaign of Super Mario Bros. 3 out of the equation, I still feel both games to be around the same level of quality, though Super Mario World edges it out slightly. Either way, it certainly is one of the greatest launch games of all time. Love the detail, made me want to play this (I have it on Wii U VC). I know this is a great game from reputation along, but I’ve yet to really play it. Thanks! I hope you enjoy playing the game when you get around to it. In all seriousness, I was expecting a 9, considering you gave SMB3 an 8. Personally speaking, of all the most revered ‘classic era’ Nintendo games (SMB, SMB3, World, 64, A Link to the Past and OoT), Super Mario World is undoubtedly my favorite. It perfected (I would even say transcended) what the previous Mario games did, and while Super Mario 64 and Ocarina of Time are excellent games, well, I think they still suffer from a few ‘Nintendo 64-isms’ (mainly the camerawork). A Link to the Past is also a game where I don’t really have anything really negative to say, but I just like Super Mario World better. It’s basically my go-to example of what a ‘perfect’ game is. Of all the games I’ve currently awarded a 10/10 to, Super Mario World is the oldest (if I ever review Tetris, that may be the only one that predates it). As far as gaming has come, I still consider SMW among my favorites (easily top 10, if not top 5). I still say SMRPG and DKC2 are my favorite SNES games (Yoshi’s Island may join them, but it’s been a few years since I played it so I’m in need of a refresher), but Super Mario World is the game I point towards as one that just gets everything right. I know, some people might say I have a Mario bias (but I have given a number of Mario games mediocre and even bad reviews). My justification is that, if I’m not supposed to praise Mario games so much, Nintendo should stop making Mario games so good. Thanks! If it’s one thing I will say right now, it’s that I feel the 3D leap benefitted the Zelda franchise more than it did the Mario franchise. Though my favorite Mario game is indeed 3D, I think the franchise managed to shine both before and after the leap in roughly equal amounts. I will also admit that Super Mario World is my favorite side-scrolling Mario game for much of the same reason A Link to the Past is my favorite 2D Zelda game – it manages to grasp something later games attempting something similar either didn’t or couldn’t. In the case of Super Mario World, the just the fact that the world gradually opened up as you found more exits made it something special. Of the side-scrolling installments, it’s by far the more exploratory, almost coming across as a Metroidvania at times. Meanwhile, New Super Mario Bros. and its three sequels don’t really capture what made Super Mario World so good (though New Super Mario Bros. U came closer than its predecessors). The main reason it doesn’t get a higher score than Super Mario Bros. 3 is because, all things considered, I feel the two games end up in the same spot quality-wise, though it does edge out its direct predecessor. If I were making a list of my favorite SNES games, I’m fairly certain that Super Mario World would be in the top ten somewhere. As of this writing, the oldest game I’ve awarded a 10/10 is Planescape: Torment (released in 1999), and none of the 10/10s I have yet to review predate it. There are certainly worse things you can be biased in favor of; at least you picked a franchise with myriad quality titles. Hmm, that’s an interesting take. I suppose Zelda did actually get indisputably better when it jumped to 3D (though ALttP is still an all-time great), whereas Mario has withheld its “king of the mountain” quality through both its 2D and 3D iterations. So I guess it does make sense to say Zelda benefitted more from the jump to 3D (though I would also use this argument as to why I ultimately think the Mario series is the better of the two, not that there’s anything wrong with coming in second in this scenario). Though I guess one could argue that Mario benefitted greatly from the jump to 3D as well for one simple reason: the series no longer had any real competition in its genre. Now, that’s not to say that there aren’t other great 3D platformers, but aside from the N64 Banjo-Kazooie titles (which ultimately equated to a two-year timespan), does anyone really mention any 3D platforming series in the same regard as 3D Marios? Sure, Mario had the most acclaimed 2D platformers, but he also shared that spotlight with Sonic, DK, Kirby and Mega Man (and Castlevania, depending on how much you consider that a platformer). But again, aside from that aforementioned Banjo-Kazooie shaped window, 3D Mario hasn’t really shared its throne. It’s an interesting discussion, at any rate. I agree, Super Mario World almost does become a Metroidvania in its own way. Kind of baffling how other 2D platformers haven’t figured out how to make that work. And I agree, NSMBU – while no SMB3 or World – was a big improvement to the other NSMB games. I might even hold it in higher regard if it didn’t face the inevitable comparison with Tropical Freeze, which is absolutely sublime. I’ve been meaning to play Planescape: Torment for a while now. I own it on Steam, and – by God! – it can actually be played on a Mac. I am a little sad to hear that is the oldest 10/10 you’d give though, if only because it means SMRPG and DKC2 won’t be getting that score (I was hoping DKC2 would be the 10/10 you, me and Matt of NintendoBound could agree on…yes, I think about this stuff). It must seem like I give a lot of 10s, which is a bummer, since I don’t want to come off as simply “this game’s good, it gets a 10” and actually want the score to mean something. But I will say that I’ve certainly reviewed the majority of my 10s already. When I first launched my current site, I could say I had less than ten games I’d give a perfect score to. But by writing more and getting a more definitive feel for what I think warrants the score, I came to see Undertale and Dark Souls as 10s, plus Breath of the Wild and Super Mario Odyssey were released in the same year, which upped the maximum number by a (relative) lot. Hope I don’t seem like too much of an easy grader. Though I suppose that’s a better alternative to being the typical “I hate everything” type that floods the internet these days. Well, if nothing else, I think it demonstrates that Mario is probably the more dynamic of the two series considering it managed to be good both before and after the 3D leap. However, by that token, I still believe that Zelda managed to achieve a greater level of quality with its own 3D installments than Mario did. It was like Metal Gear; a franchise that was just aching to be 3D for its entire existence and the technology called out its true form. Then again, this is definitely splitting hairs; both series utterly decimate other developers at their best with their respective sixth-best installments. I would actually argue it’s the other way around; I feel Mario benefited the entire medium by going 3D more than it did its own franchise. It certainly was aided by the leap, but it was eclipsed by the sheer impact it had on others. At least half of the games getting awards from the press today owe at least part of their existence to Super Mario 64’s success. And Super Mario 64 was a lot like Super Mario Bros. in that it didn’t really have much competition to speak of, but I would say the former has held up much better than the latter; the fact that it turned out as well as it did is astonishing in hindsight. I may have to go over it again in my head, but I actually feel that Yoshi’s Island is a slightly better game than Super Mario World, though it’s the next game I intend to review, so I’ll say more then. The New Super Mario Bros. series is weird to me because I’ve found that most of them have one thing I wish the other games would do, yet none of them do all of them. For example, I feel World 8 of New Super Mario Bros. Wii is the best eighth world in that subseries, and none of the other games offer as solid of an endgame. Meanwhile, I like that New Super Mario Bros. 2’s bonus world ends with a boss fight, but none of the other games have that logical conclusion. Finally, I like how New Super Mario Bros. U handled its exploratory elements, yet it wasn’t nearly as advanced as that of Super Mario World. As for which one is the best, it’s a tossup between Wii and U.
Yeah, I guess I kind of tipped my hand there, didn’t I? Donkey Kong Country 2 is doubtlessly my favorite 2D platformer, but it’s not quite a 10/10. With me, a game basically has to do something almost completely impossible to get a 10/10. I’m not even sure what it is, but I would say it’s a once-in-a-lifetime achievement that most people simply aren’t capable of. Planescape: Torment earned it in much of the same way Undertale did; it’s a very avant-garde game with a thought-provoking story. Usually, you can tell when an uncreative artist took a list of clichés and reversed them to appear subversive, but in Planescape: Torment, it was masterfully done; the writers clearly thought through their implications. In fact, I like to say that Undertale is basically the Planescape: Torment of its generation. I now think Undertale is the better game for being more compact and convincing a mass audience that it’s good whereas Planescape: Torment took some time to build its legacy, but it is a masterpiece in its own right. You see, the problem with that criticism is that it’s clearly not applied equally across the board. If one were to say they were biased in favor of something like The Last of Us, I doubt one would get many (if any) accusations of being a fanboy/fangirl. That’s a good point. I guess I was only looking at things through the perspective of the genre, but in terms of gaming as a whole, well, the whole of gaming benefitted from Mario’s jump to 3D. And yes, Super Mario 64 has aged beautifully. Although I prefer the Galaxy games and Odyssey, Super Mario 64 is still a favorite of mine (surprise, surprise). The fact that it was Nintendo’s first attempt at a 3D game is bewildering. For all intents and purposes, it shouldn’t hold up as well as it does. Liking Yoshi’s Island more than Super Mario World is understandable. Many people consider it the best 2D platformer ever, and that’s an easy point to see (even if I’m on team DKC2). Even though, again, I need to replay it to review it, if it’s as good as I remember, it is another “at least a 9” game for me. I can totally see that complaint with the NSMB series. That final boss in NSMBWii was, well, boss. I actually pre-ordered the Switch re-release of NSMBU. NSMBU was a marked improvement in level design, and the Luigi DLC brought a nice challenge. I will admit though, that back at the E3 when Nintendo announced two NSMB games (2 and U), that was maybe the one timeframe where I thought maybe the Mario series had stopped innovating. Of course that was put to rest pretty quickly thanks to Super Mario 3D World (even if it wasn’t the “big Mario” we hoped in the vein of 64 or Galaxy, but we also eventually got just that with Odyssey). I’m actually looking forward to the Switch re-release of NSMBU though, since more people I know have Switches than had Wii U’s (surprise, surprise), it will be easier to get-together and play its multiplayer mode. Well, let’s word things this way: DKC2 is a 10. But for the sake of your review, that 10 will be oddly shaped like a 9. 😛 I promise I’ll get to Planescape: Torment soon. You got me to try out Undertale, after all. And that did not disappoint. Yeah, it’s funny how selective the cries of fanboy/fangirl are. And it’s a shame people will use that card if someone enjoys a particular franchise (playing into the whole “sequels can’t be art” nonsensical mindset and such). People seem to have forgotten that people have favorites for reasons, and that they don’t just randomly like a particular franchise just because. I remember a number of years back, my brother told me about a discussion he had with a friend about which (then)current animated series had the most fluid animation, with my brother believing Adventure Time (his favorite show) did, while his friend thought the revived Futurama did. And apparently his friend insisted my brother claimed Adventure Time had the superior animation because he was a fan of it. But it seems the more logical reason is that his belief in its sharp animation is one of the reasons it’s his favorite. So when I say the Super Mario series is my favorite in gaming, it’s not in this bizarre “Mario is my favorite so this game is a 10” sense that the internet seems to buy into (particularly with Nintendo games). Mario is my favorite series because I think it has more “best games” than any other one series, and because of the impact it’s had on the medium. There are some bad Mario games, sure, but it’s a case of the good being so good that, when the bad is present, it doesn’t really affect the series as a whole. I mean, if that 1993 movie couldn’t stop Mario, what can? Thanks! I’m glad you enjoyed this review enough to stick with it to the end. If somebody told me when I was starting that I would A) review Super Mario World and B) said review would be over 7,000 words long, I wouldn’t have believed them. This was the other Mario game I had that also drove me nuts. I don’t think I ever made it past either the ghost world or the one with the swinging spiky balls (forgive me, it’s been over 35 years since I played it)! Was this also the one with the bonus round where you had to line up the moving pieces of an image to make a set of three images of a star or a mushroom or was that Mario 3? 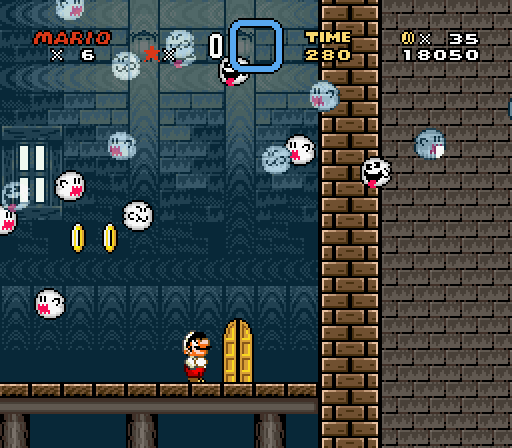 There are Ghost Houses in Super Mario World, but there isn’t a ghost world. The closest thing I can think of is the Pumpkin Zone from Super Mario Land 2, which was a Game Boy title. The only bonus game that can be played at the end of the stage is the one pictured above. The one you just described sounds more like one of the bonus games from Super Mario Bros. 3. 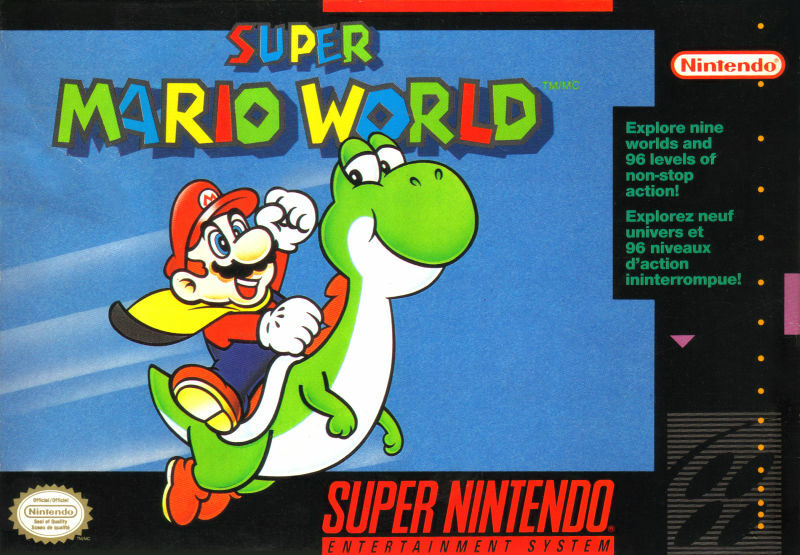 I didn’t pick up an SNES of my own until it was near the end of its release life, but even then, among all the games that came in the years afterwards, Super Mario World stood out as something special. I think I really appreciate just how many unusual ideas it brought while still having a very solid sense of design. It went in so many different directions, yet they were all aligned in making the whole experience greater. This is really a game that’s so much more than the sum of its parts. Weirdly enough, that’s true of me too; I didn’t get this game until the Nintendo 64 was released. It wasn’t for a lack of trying, however. I would always ask my parents for this game, but they could never find it. Remember back when that was a thing that could happen? I do and I’m glad those days are mostly done with. I rented it from Blockbuster quite often, and I wouldn’t get my own copy until 1997. As for the game itself, you’re spot on. As a cohesive whole, it does form something greater than the sum of its parts. You really get a sense as to how large Dinosaur Land is when it’s one cohesive world.